How do you know whether you’re doing the right thing as you pick up your rental car from the company forecourt? It’s stressful, it can be expensive and you’re worried about being ripped off. 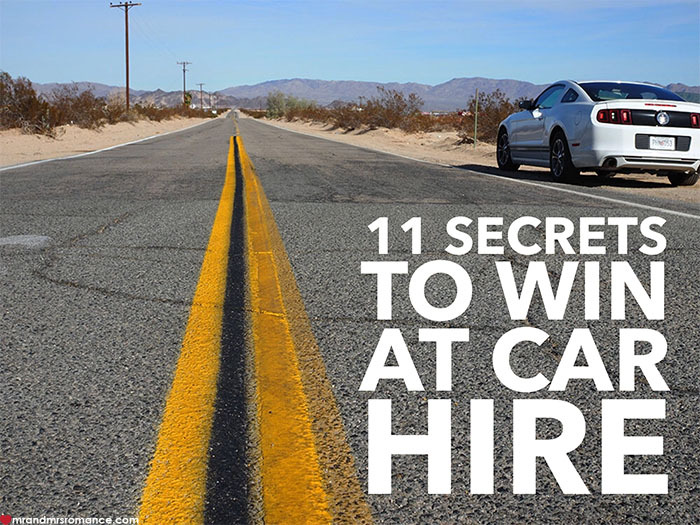 Here are our top tips to win at renting a hire car. Fun fact: we don’t own a car. Usually you only rent a car when you’re on holiday but we also hire cars when we just want to get out of the city. It’s just more affordable and simpler than long-term city parking. Plus we don’t have to pay for maintenance or bother with cleaning it. 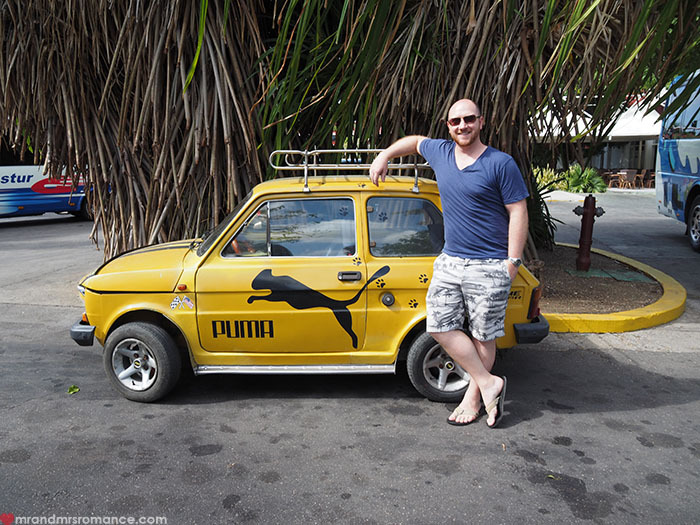 With all this experience with car hire, we thought we’d share the things we’ve learnt over the years. Start your hire car hunt here. 1. Which side is the bloody petrol on? 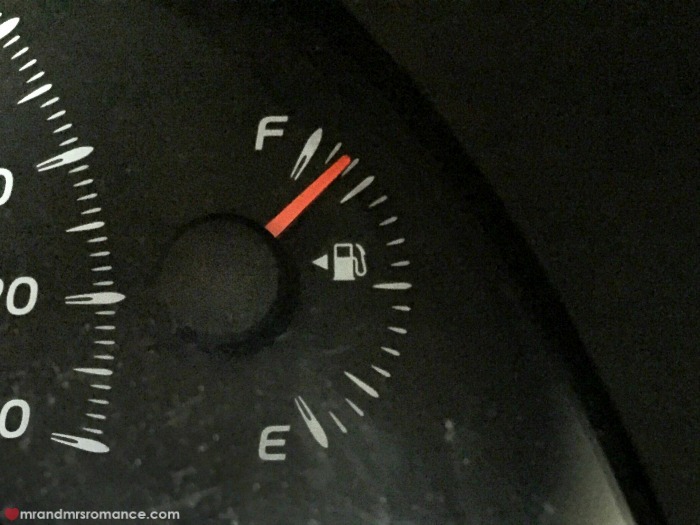 Every car (even non-rentals) has an arrow next to the gas pump symbol, which is next to the petrol gauge. Well, 80% of cars do. It points to the side you fill ‘er up on. If your car doesn’t have a little arrow, the handle on the little petrol pump picture tells you which side the cap is on your car. When you’ve decided which car hire company to go with, shop around where you can pick the car up from and drop it off. Some – like airport offices – have premium location charges. Downtown locations are often cheaper. Look round the car carefully before you even get in. Often an employee will come with you and note down any damage. If you spot anything you’re not sure about, mention it or note it down. Some people recommend taking photos of any damage – or lack of damage – before your leave and when you return your car, but we’ve never done this. The company would have to be pretty dodgy to pull something like trying to charge you for damage that doesn’t exist. If they do, contesting it should stop any further action. Marks on the boot where people chuck their luggage in won’t usually worry the car hire company. Other minor scratches on high-traffic areas like door handles and keyholes will probably be considered wear and tear – but check with staff anyway. Make sure you’ve got a full tank before you drive off. Most places have a return-tank-full policy, so make sure that’s what you’re leaving with. Some companies have a ‘return as found’ policy, which I find very odd. Take a photo of the gauge before your drive off and make sure the level’s noted on the paperwork. Some companies try to sell you the deal where you pay a pre-set price for fuel before you leave the office. It can sound like a good deal, but it rarely is. All cars drive differently. Some have very sensitive brakes, some don’t speed up very quickly, some steer weirdly or have a tiny turning circle. Drive for a short time, get out, then get back in again. Your brain does a sort of weird reset and you’ll find you can drive the car better next time you get behind the wheel. – does the car smell of cigarettes or anything weird? We once had a car that stank of Tabasco sauce – we think someone had broken a bottle in the boot. We took the car back and got a different one. You usually get 59 minutes’ grace (sometimes only 30 mins) to get the car back on time – check with the company. If you’re more than 3 hours late, you might as well pay for another full day, as charges will probably exceed the daily rate. We don’t usually bother with extra car insurance. If you have travel insurance, that should cover your excess – but check first! If you’re travelling domestically and haven’t bought travel insurance, we’d recommend paying the reduced excess – it will help if there is an accident. If you need to buy extra insurance for your rental car, look at independent insurers like insurance4carhire.com. 9. Only book basic packages – ignore pressure of add-ons and upgrades at the desk. Booking the car for a bit longer can lower your base rate especially if you book into a Friday or Saturday to get a weekend rate. Try adding an hour or two – or even an extra day. If you don’t need your car for that long, just return it early and the company will refund you the remaining time of your booking. Some firms like Hertz, National and Foxx do have early drop-off charges. Check what the fees are – if any – first. They’re likely to be less than late penalties though, so you might want to do this to give yourself a time buffer anyway. For maps, use your mobile. If your phone doesn’t work overseas, you can still use it in airplane mode if you use an app like Galileo offline maps. Download the map of the country or area you’re visiting using before you go. Location services will still work. We used this in Cuba – a place where the internet does not exist – and it worked perfectly. Finally, of course, make sure you know the local road rules. 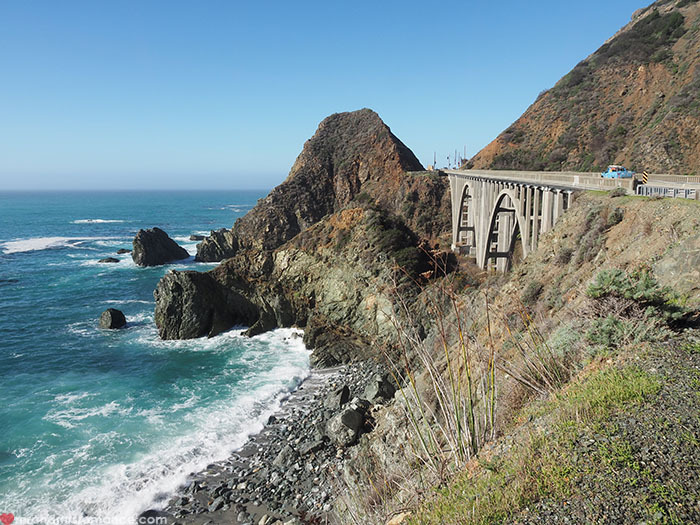 Here are our tips for driving in California and our tips for driving in Mexico too. There’s nothing like the freedom of a road trip and being able to go wherever you want whenever you want on vacation. Don’t let the hidden costs or dodgy dealings of car hire companies spoil your time. Do you have any tips for hiring rental cars? When was the last time you went on a road trip? Tell us in the comments! I’m a big GoGet user for inner city car hire. So much easier than going to the hire centres in town. There about 10 cars within 10 mins walk from my house, and two at the end of my street! Yes, GoGet’s a great idea, isn’t it Elly? We’ve got quite a few near us too. Great that you don’t even have to worry about putting petrol in. The only reason we haven’t joined up is because on the occasion we do need a car, it’s over a weekend, which works out more expensive with GoGet. We have a great account with our hire car co – been using them so long they give us free upgrades and are pretty cool about if we’re a bit late bringing the car back. It’s only a five-minute walk for us to our closest rental place too – disastrously with a pub on the way! If we didn’t have that account, GoGet or perhaps one of the other ones would definitely be on our radar. I like tip no.5…I’m going to try that next time I rent a car. I like to take a photo of a rental car before I drive it away, so that if my first stop is a huge carpark I can remember what the heck type of car and colour it is! It’s weird how it works, Fairlie – it’s a trick my brother taught me from when he was a driver in the army. Works a treat. Nice idea with the photo actually. Not just because it’s hard to remember what you’re driving, but also because you’ll have your licence number for when you check into any hotels! + 1 on just booking basic packages – I’ve lost count over the years how many times I’ve been upgraded to a premium car because all the budget cars are out! It’s a great trick, isn’t it, Sarah? There’s nothing better than getting an upgrade – it’s even worth asking if what you’re getting is the best they can do for you. If you ask nicely, sometimes the clerk gives you a better car. Worth a try, right? Some rental car companies can look for the smallest of damages, so that they can charge you! make sure you check thoroughly! Good point, Sam. Yes, always important to go round the car thoroughly with the damage report sheet before you get in. Don’t be afraid to point out the smallest scratch. The hire company is obliged to mark it down. That way you won’t get stitched up at drop-off. London has a reputation for being rainy and cold. 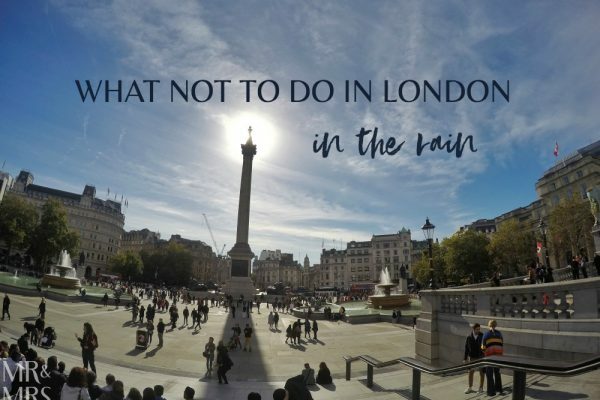 In fact, the city rarely experiences proper downpours – drizzle, yes, but not a deluge….